Hey guys it looks like another long weekend with some diving. Not sure how good it will be with the vis pretty poo at the moment. There are some southerlies due and that should clean things up. Friday arvo / nite is Salty's Club nite and that is always a highlite!! Things will probably be fairly chillaxed and we will get together early at 5 bells. I am going to try and get some buggs for the braai and will russel up a dvd or something to watch. A bunch of the mates went up to Mozambique spearfishing half way through April and got back this past weekend. They had gone up to a spot that is kind of off the radar so to speak to investigate some huge drop offs. They got dupped and the water was green, too green to spearfish in. Andy said he dropped onto the one pinnacle in over 20m and the vis was only a meter on the bottom! So he jumped back in the boat and called it a day. The guys then decided to drive through to Barra a couple hours away, where the diving is almost guaranteed. The water was good, a little cool for up there but the vis was 100% better than the last spot. They spent a couple days there and got some great fish. The fish weren't thick but it sounds like the guys had a jol. Craig got the fish of the trip a 38kg Sailfish and even had a shot at a Marlin!! He fought the Marlin for a while before the spear pulled. proving once again that there might not be loads of fish at Barra ..but you could always get lucky with a big one!! You Got to love long weekends!!! Nothing overly epic happened but we got to dive and surf. There were a few sneaky snoek around once the vis cleaned up. The surf was small and fun and best of all it was a Monday and we did not have to rush anywhere!! This week looks good all week ... maybe just maybe it will turn on! lastly anther mate while diving at Jex lost his FreeDivers Reel Gun. He said that some chap had paddled past it on his ski but thought that a spearo was with it. So if by some chance you were up that way or heard of some one finding a reelgun floating around please just give me a shout. Spearfishing DVD Video "Good Times"
After months and months the Spearfishing DVD Video Good Times finaly got shown to a small bunch of guys that gathered around to watch the DVD for the first time. We waited nervously to see the response of the guys at the end of the DVD. The hour flew by so quick the DVD sucked everybody in, and ended with applause and loads of complements. ... too stoked!! There is still a little more leg work to do before we get it on burnt to glass master, but we are looking at releasing the dvd in July. I just got a mail from Ryan Bermester saying his car got stolen while spearfishing at Christmas Bay. How's things going, just wanted to warn you guys that my car got stolen from where we were all parked this morning, while we were at Umhali police station there was an Indian chap we meet whose car had also been stolen at around the same time as mine but from the other car park just further south where the big bend in the road is, so take care and let everyone know. It sounds like a syndicate steeling the cars. They seem to hit the place for a couple weeks and then it cools off for a while. It would be interesting to find how many cars actually go missing there every year. I know the breakin's are something silly, the ground is continuously glistening with glass frost from broken windows. 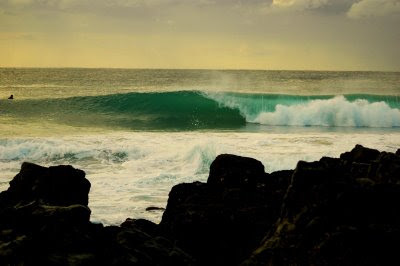 Well the ANC did one thing right, they made Voting Day on a day the surf cooked. If they could organise that every weekend ... I am sure they might get a few more Votes? Or not!! Politics aside yesterday was a fantastic morning, the swell was perfect the conditions were epic and with the banks just starting to show some life the wave started to show some real form. I got down just after light and there were some guys already on Sunrise which was starting to look like the Sunrise of old. I could see the current was already pushing and the guys were having to constantly paddle up the river to keep on the spot. I opted for Surfers ... no one out and the odd bomb grinding on the inside bank. I bagged a couple real cookers before a couple guys pulled in to join in on the barrel fest. I kept see the guys running across to Sunrise from the parking and I could not help myself I had to go and check it out. Sunnies was working there was a strong crowd of about 10 guys all paddling like mad to stay up the point. I got one good barrel as I got there (probably while I was still fresh) but spent the next hour trying to get onto the spot and never really got anything special. I went back out at Surfers ... less of a mission although I think the real bombs were at Sunrise ...I must be getting old!! 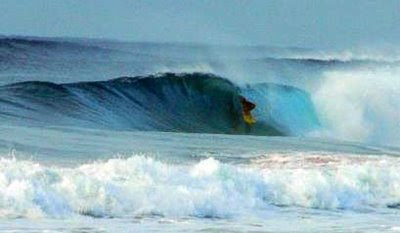 We surfed until the east picked up and took the rest of the day easy, Voted and then hit the couch... nothing wrong!! Well it was fine sun tanning weather this weekend ... there was some surf but nothing special & the dive was bleak. Well thats until at the last moment late yesterday arvo it turned, and Hogga the only human with sonar capabilities for hunting in bad vis smaashed some snoek. But from there on out it Poo Balls and looks more like a typical October week with easterlies screwing everything up. I do hope that is not a phrophetic of where the elections will take this country!! On a lighter note ... if you are at all interested in the local surf scene: Jordy Smith came 3rd at Bells Beach in Oz and this puts him 3rd on the ASP tour! I dont think anyone from SA has been in the top 5 since Shaun Thomson's days!!! I am not sure when this pic was taken, but look no rocks in the channel!! 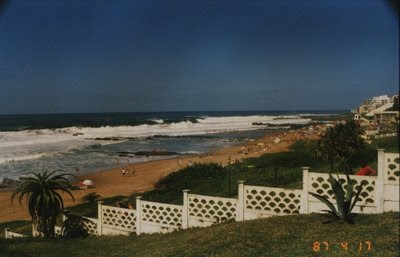 I have a whole bunch of pic of the beaches in Ballito from as far back as the late 30's. There are some really interesting observations like the pic above that shows that there were no rocks in the channel between Boulder Bay and Bog Bay. I am still looking for more old pics of the beaches and of the surf especially from the 70's & early 80's. Please drop me a mail if you have any or know some one who might have. Well the weekend had some waves and for those who ventured out for a dive also had some fun! Sunday was the day with the surf cranking in between the close out setts. As the tide drained we had some solid barrles .... Mmmmm bring on the winter! I almost dived Sunday arvo but was rather tierd after my 3 hour surf in the morn and missed a very good oppertunity, as there were some fish around. I heard the Shoal was nice and clean and the guys who were there early while the current was north - south scratched some fish. This morning the surf was pretty good, and as I am at my desk I am sure it is getting even better as the tide drains ..... I cant complain I had one two barrles and some cookers here and there. Better than a kick in the balls. Other surfing news Kelly Slater has been knocked out of the Bells in Oz by 19 yr old Owen Wright!! Looks like Slaters 10th world title is going to be more dificult than he thought! 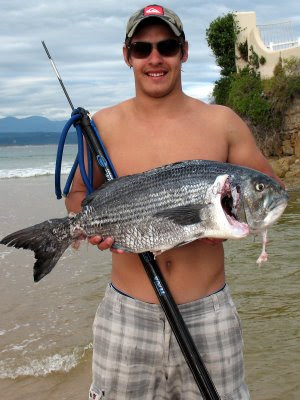 I managed a snoek and some buggs so it was not a waist, but I was seriously keen to try find a cuta. Every day we dont get one now the less chance we have tomorrow. Here at home is notorious for going quiet now as we head into winter. We often have clean water but only to odd lost cuta or snoek. I think we might start looking south... Aliwal for Wahoo and Hiberdene for cuta. As winter approaches we will start to see some Cracker and Garrick .. I always dig hearing whats going around the coast so keep the stories coming. The Aliwal Shoal starts to produce some Autumn Wahoo! 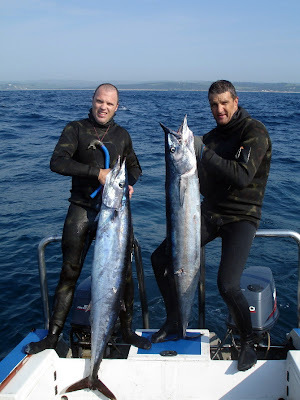 As we head into winter spearfishing Wahoo on Aliwal Shoal becomes the thing to do. The conditions need to be just right, the current north south and good vis of course. Guys like Alistair Louw, Basie are the locals in the know. They snuck in a good innings before the west yesterday and bagged 2 good sized Wahoo. These guys always have their finger on the pulse, and score almost every time its on. Me on the other hand have had lemons every time I have been to the shoal. I suppose that's why Alistair has been able to make a business out of spearfishing Wahoo on the shoal. His hit rate on picking the right days is mind blowing. Often one of the guys like Basie will be out on a scuba charter and see the conditions are good. A call is made and with in a few hours the guys are on it. But often by the next day it off again, it can be fickle. I suppose that's why I have never got it on. I always seem to go a day or two after hearing its on .... a kind of long shot! It is probably worth your while giving Alistair a call -079 694 6765- and seeing if there is space on a charter or to organise one if you have 4 or 5 guys to chip in. My mate Wayne has scored every time he has gone with them, getting a sailly of 34kg on the one trip. Weekends Spearfishing and Surfing update. Well the weekend started off with the Salty's Dive Club Meeting. It was well attended and we had a really interesting chat by Brent Addison chairman of SAUFF. Out lining some of the issues that spearfising is facing in South Africa. We also did a gun give away and Stef won a speargun of his choice, some other small goodies were also given away. At the same time Grant Somers and crew were doing a Spearo Camp, I popped in on Saterday and helped out a little. We were going to jump in the sea, but the swell was rather large for the new guys let alone myself! The Spearo camp was a real blessing to the guys who were like sponges sucking everything up! The east pumped yesterday and I dont think any one ventured into the sea ..at all. But as I am writting the west has pulled in and with it hope for some good waves and some better diving conditions later this week. Pending World Spearfishing Record 70kg Caranx Ignobilis - Giant Kingfish shot by Alan (Moo) Fraser. 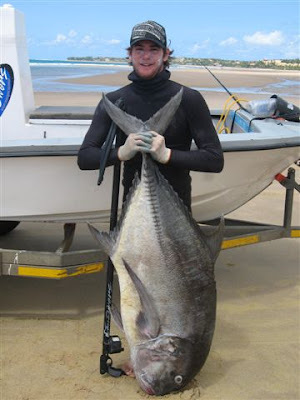 Alan (Moo) Fraser shot a huge 70kg Ignobilis off Mozambique. As far as we understand it is a pending World Spearfishing Record. If it is not accepted as a World record ... its still counts ...some how! This is what Bog can produce and more - Sean VO digging deep. Bog Bay finally has a shot at being revived. More than 20 years ago the Ballito municipality put in rocks to form a tidal pool, and it landed up stealing the surf right from under our feet. But now that the Mr Price Pro is hitting Ballito's shores the lights and focus are on surfing for a change. I have been chatting to some of the key figures involved and we really need to get our act together to make this work. We have a small window of opportunity with this .... lets get cracking! The first step is just joining the groups, keep in touch and spread the word! Mr Price Pro comes to Ballito!! Well the unbelievable has happened!! The Mr Price Pro is coming to Ballito ... serious stoke to watch whats going down ...but we did enjoy the crowdless surf when every one headed to durban to watch the comp in the old days. The world famous Mr Price Pro surfing competition is moving location for the first time from Durban's North Beach to Ballito. The competition takes place from June 26-July 5. The competition will take the form of a "mobile" event, using the world class beaches of Salmon Bay, Willards, Surfers, Tiffanies and Tinley Manor and making use of the varied excellent surfing conditions available. Mr Price will be partnering with the Kwadukuza Municipality to organise and run the surfing competition and will work with the local community to build a beach festival around the activity, including free music concerts and other beach related events. Stuart Bird, Mr Price CEO commented, "The moving of the Mr Price Pro surfing event to Ballito means that it can only get bigger and better. The location is perfect for a world class event such as this and the local municipality has been incredibly supportive in working with us to plan the event." He added: "We would also like to express our thanks to the eThekwini Municipality for hosting us in Durban for the past nine years and for all of the support they have given us." Kwadukuza council mayor, Thulani Khuluse added: "We are incredibly excited to be hosting the Mr Price Pro event in Ballito this year and are looking forward to the opportunity to showcase our beautiful area and perfect surfing conditions to the world." Colin Fitch, operations manager of the Association of Surfing Professionals Africa commented: "The Mr Price Pro remains one of the most prestigious Association of Surfing Professionals (ASP) World Qualifying Series (WQS) events. It has become one of the major events on the international surfing calendar and an important stop for surfing professionals from around the world. Many of them have surfed the breaks at Ballito before and I know many are looking forward to doing so again." Professional surfer and resident of Ballito, Tammy Lee Smith said: "Ballito is a well-known surfing location internationally and the bays and rocky outcrops along the North Coast offer a huge variety of waves, ranging from tame shore breaks to hollow beach breaks to challenging reef breaks." The event now attracts more than 250 entrants from 11 nations. The total prize purse is $175 000. I guess the one up side of this is that maybe the surfers can and will be heard ...and the rocks at Bog will be opened up to get our banks in fine shape. So please keep looking for old pics, chatting to anyone you know in the municipality and keep the pressure up!! Mr Price Pro!! its bringing the pro's and the crowds like it or not ...atleast its only 2 weeks!! The exciting thing will be the insain surfing!! 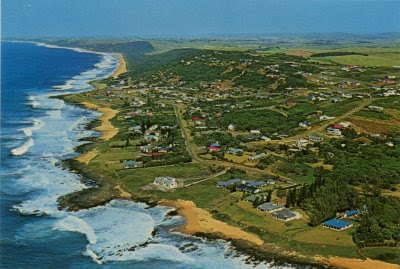 There is a "Spearo Camp" going down up our way on the North Coast this weekend. It has been put together by Grant Somers and the guys at Freedivers. The weekend is aimed at the entry level spearfisherman, and from what I hear it is something you dont want to miss. There will be some basics from equipment tech talk to practicals in the pool and sea. Its not often guys will take the time out to lead the new guys through the basics. I know that even if you have been diving for some time there will be something to learn. These guys have decades of experience and are willing to share it. Friday Night - Freediving theory and spear gun mechanics, spearing Movie! braai for supper. Saturday-afternoon (intermediates) freedive deeper water. (beginners) sight targeting. Saturday night- boat, shore and safety. SAs Best spearos in action!! GREAT SPEARING VIDEO and braai. Sunday- Beginners get to go to sea! There is a small cost to help cover costs ..R80 cheap!! There is also accommodation available if you need to stay over. Call Grant on - 0832274917 or check in at Freedivers for more info.